To a slow cooker, add chicken (un-cut), diced carrots, onion, celery, and garlic. Drizzle olive oil over top then add in chicken broth, water, thyme, rosemary, bay leaves and season with salt and pepper to taste. Cover and cook on low heat 6 – 7 hours. Remove cooked chicken and allow to rest 10 minutes, then dice into bite size pieces. Meanwhile, add egg noodles and parsley to slow cooker. * Increase temperature to high, cover and cook 10 minutes longer (or until noodles are tender). Toss in cooked, diced chicken. Serve warm with saltine crackers if desired. *I typically cook my noodles separately which allows me to make egg noodles as well as gluten free noodles for my husband. It also keeps the noodles from getting soggy should you happen to have leftovers! 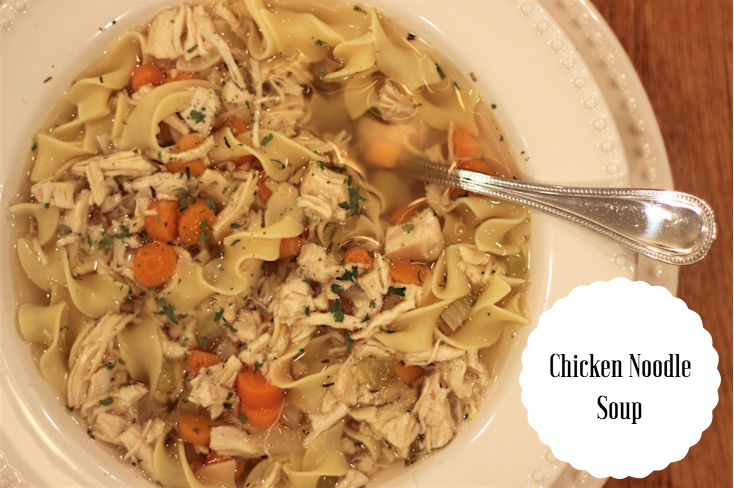 I’ve never made chicken noodle soup in the crock pot, but we love homemade chicken noodle soup…so this sounds like something I need to pin! Thanks for sharing!